We’ve been installing single seam metal roofs across Alberta for more than a decade. And, while metal roofs are certainly not new, the technology has rapidly advanced, making them one of the most durable and economic choices for your commercial or multifamily building. Whether yours is a new construction or re-roofing project, give us a call. Our commercial roofing team is the best in the business when it comes to project management, high-quality work, meeting timelines and budgets, and building relationships with our contractors and builders. Because the fasteners are concealed, only a smooth ridge is visible, making your building look fantastic. You can choose light-colored metal roofs if you want to add the benefit of UV-reflection. 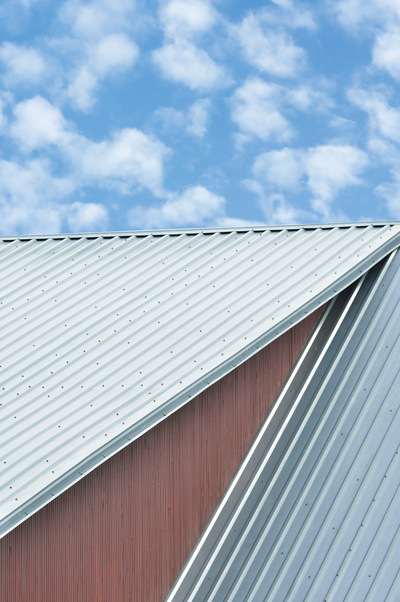 Light-colored metal roofs can help keep your building cooler under the scorching sun. Or you can choose a color that adds a lot to the architectural style of your commercial building, office complex, restaurant, or boutique. In addition to looking great, the high seams eliminate the weak points you’ll find in other metal roofs or composite shingle roofs. And, for tough climates, like ours here in Alberta, you really won’t find anything that’s much more durable than single seam metal roofs. The material and the installation process make these roofs tough as nails. When you’re working with Iron Shield Roofing, you can expect your new single seam metal roof to last 30-50 years. They are extraordinarily fade resistant, and in the off-chance that you do need a repair, they are typically quick and easy fixes. So, while the initial cost of materials may be a bit higher than other roofing materials, you aren’t going to find a better overall return on your investment. You may have some roofers try to steer you away from metal roofs. That’s probably because they don’t have the expertise and experience they need. When you’ve got more than a decade of experience installing standing seam metal roofs, like Iron Shield Roofing, you can be assured that your team has the experience and expertise to get your roof installed correctly, on time, and on budget. So, whether you are deciding between a metal roof, rubber roofing, or traditional asphalt shingles, give us a call. We’re happy to meet with your project team, discuss the pros and cons of each, and help you reach the right decision for your building. ©2018 Iron Shield Roofing. Do not copy. All rights reserved.